(I forgot to put the updated one on the computer.) Anyway the story is continuing. 1. When you get a $5 gift certificate to an online quilt shop, how much do you spend? Pour batter over apples and bake for roughly 45 minutes, just watch the cake so that it doesn't burn! The top should be lightly brown and cracked, and the apples will remain at the bottom of the cake. 5. Yesterday, I started to sew my hexagons together. not the quickest process going. But I found out that I need to baste some of my 1 ofs, because I am trying to keep things spread out. As I type that, I realize that even if I stitch up all of the basted hexies now, by the time I start to stitch flowers to each other, they can still spread out... 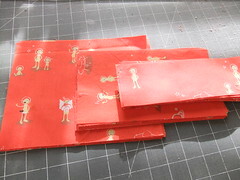 But it was nice to cut some green hexie charms while I cut the greens for the Mix Tape quilt. & It was nice to think about my charm pack additions - lots of 1 ofs there.